If you are beginning to experience presbyopia (age-related farsightedness), there are several treatment options that can improve your close focus, allowing you to eliminate or reduce your need for reading glasses. Patients interested in presbyopia treatmentcan meet with Dr. Sonny Goel at his Baltimore, MD-area practice to learn more about treatments such as monovision LASIK and cutting-edge conductive keratoplasty to decide which option is the best fit for their needs. Dr. Goel is passionate about helping patients regain their visual acuity, and he is highly trained in the latest vision technology. He will take all the time needed to answer your questions and ensure that you feel comfortable in your chosen course of treatment. While presbyopia is a natural part of aging, compromised focus does not have to be. Dr. Goel's sophisticated treatments can help you achieve close focus after the onset of presbyopia. 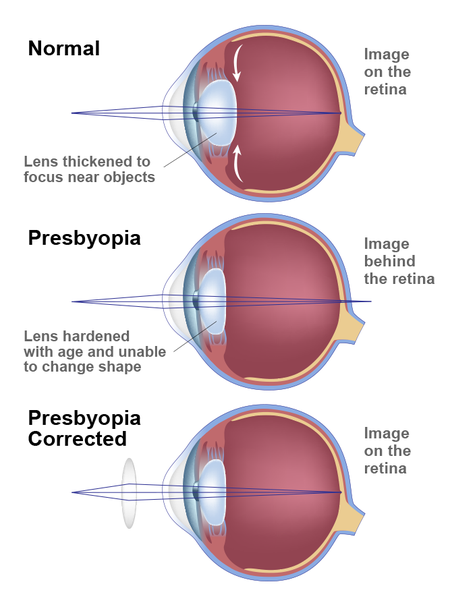 The most basic treatments for presbyopia are glasses and contact lenses. Patients who wear glasses for myopia or astigmatism may need a second pair for reading and other close-up tasks. Bifocals can be another option. For those who do not have any other vision problems, only one pair of glasses would be necessary. There are two contact lens options for presbyopic patients, especially those who already wear glasses. One choice is bifocal contacts, which function similarly to bifocal glasses by correcting distance vision on the top half of the contact and near vision on the bottom half. The other option is to use contacts to achieve monovision. This means that one contact lens corrects near vision while the other lens corrects distance vision. The brain learns to accommodate to achieve focus at all distances. This special variation on LASIK surgery allows patients to achieve permanent monovision through surgery. Dr. Goel can correct distance vision in one eye and near vision in the other. Patients often "preview" the results with contact lenses to determine if they wish to undergo surgery. Some presbyopic patients are also beginning to develop cataracts. For those patients, intraocular lenses (IOLs) may be an option. An IOL replaces the patient’s natural lens, and is an integral part of cataract surgery. Like a contact lens, it has correction that improves focus. There are many types of IOLs used to address specific vision needs. Presbyopic patients often choose accommodative IOLs, which are designed to flex much like the natural crystalline lens, providing close focus with little or no need for glasses. Conductive keratoplasty (CK) is a new type of refractive surgery that uses radiofrequency (RF) energy to reshape the cornea instead of using a laser or scalpel. The RF waves produce heat that makes the cornea steeper to improve near vision. This treatment is relatively new, and only performed by relatively few surgeons, including Dr. Goel. If you are interested in learning more about the various treatment options for presbyopia, contact our office today to make an appointment with Dr. Goel. While presbyopia is a natural part of aging, compromised focus does not have to be.